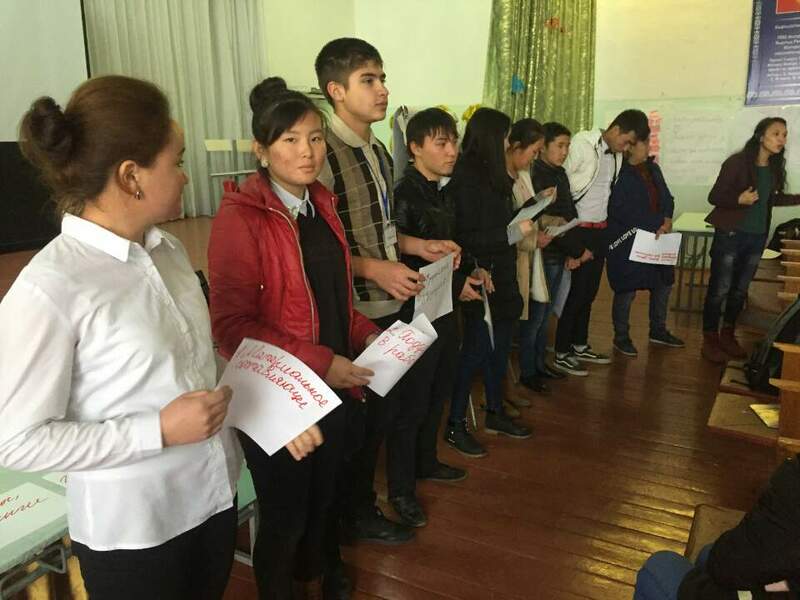 From November 26-28, high school students - members of the school parliament (SP) and representatives of the local governments of the Issyk-Ata district in the frames of "Kyrgyzstan Friendly to Children and Youth" project were trained how to strengthen the role of school parliaments. Training was conducted for 50 schoolchildren from five schools in the Issyk-Ata district. They learned: how to work in a team, effective methods of managing the SP, how to build partnerships with local governments and how to promote the work of the SP in social networks and media through the creation of the school press. "The project "Kyrgyzstan friendly to children and young people" is aimed on increasing the level of youth involvement in decision-making processes in the family, school and society. As well as promoting youth participation in problems solving and social conflicts through non-violent methods" told Guljigit Ermatov, coordinator the UNICEF youth and adolescent development program. Project will be implemented during two years until July 2019 and includes research on the actual problems of the local population; conduction of trainings on debatable technologies and opening of debate clubs on the basis of schools; the development of interactive methods for teaching adolescents; promotion of children's interests in local development programs; leadership potential development of young people from vulnerable groups strategy development and the localization of the Sustainable Development Goals. Project participants are schoolchildren of 9-11 grades, teachers, parents, local governmentsand residents of Issyk-Ata and Suzak districts. "I believe that this project will help to promote youth voices and create equal relations in decision-making processes at the local level, as well as change stereotypical attitudes towards young people," said Elvira Kalmurzaeva, director of IDEA CA. The project is implemented by the IDEA CA in cooperation with the United Nations Children's Fund (UNICEF) with the financial support of the British Embassy in the Kyrgyz Republic.